The water-based dye ink flows smoothly and is available in a wide range of bright colors. This pen is a unique addition to any artist's box! Building Toys. But it may delay due to Custom / Weather. All 12 Beautiful Colours. Flexible brush-like fibre tip. Smooth continual ink flow. Water-based dye ink. Pentel S520 Sign Pen Black ink color fine point fibre tip pen 12 pcs in box. The snap-on cap prevents ink dryout when the pen is not in use. The pens are AP certified. The original fiber tip pen with a fine acrylic point.600M writing distance. TOTAL YOU GET 12 X SIGN PENS. Smoother than other refill leads on the market. It is standard lead used in all automatic pencils. 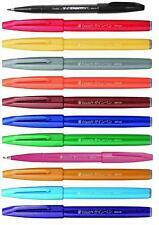 Pentel EnerGel Infree 0.5mm Liquid Gel Ball Point Pen BLN75TL "Choose 3 colors"
Item model number: BLN75TL. Color:Black,Blueblack,Blue,Turquoiseblue,Orange. Ink type: Dye Ink. If the tip gets at all worn through use, simply dip it into 60-70 degree water for an easy recovery! Ink Colour: Black. Compatible ink: XFR-AD. Surface Air Lifted 2~4 weeks: FREE! Released in 1986. Size: Height = 138mm horizontal = 10mm. Product color trend: black. Cover pattern: typography. Material: Axis: ABS grip: brass, silicon rubber knock part: brass, NBR rubber clip: iron. Every pencil contains a see-through plastic barrel pencils and each includes a comfort grip making them ideal for drawing and writing. 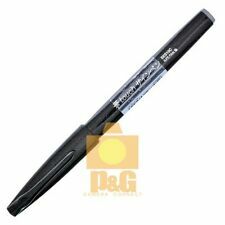 Features a fine point that writes a 0.5mm fine line. Each pencil is retractable and refillable with any 0.5mm lead. Use them to spread color on the page, or apply color directly to the brush and paint with it. Their portability makes them especially convenient for painting outside the house. They're also very easy to clean—just squeeze the reservoir to saturate the tip and brush it on a sponge or paper towel.